Floor your customers with custom-printed graphics. With smartphones occupying our every waking moment, the attention economy and the Silicon Valley marketers pioneering it are demanding our eyes are pointed in the direction they dictate for as long as is possible. Human attention is a scarce commodity, and every brand wants as much of it as they can garner. How can your marketing efforts compete? It’s simple: innovate. If you want your marketing message to be the one that gets through, you best ensure it has the maximum possible impact, and that means being seen in places potential customers might not expect. With a new generation of customer constantly looking down at their smartphones, how about distracting their flow with some smartly-positioned floor graphics—your marketing materials should pop up where they’re least expected. Floor graphics, Be remembered, make a lasting and positive impact with unique marketing materials. Studies in test stores have shown that where floor graphics were used, turnovers scored 23% higher than in similar stores without those floor graphics; and that’s before we talk about the increased brand exposure. 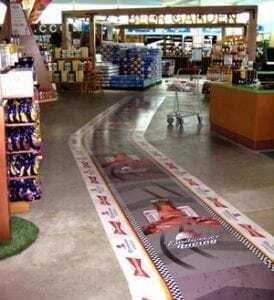 Floor graphic ads generated three times as any positive reactions as other forms of in-store advertising. Literally wiping the floor with other forms of marketing materials, isn’t it time you looked down in order to put your brand on the up? Floor graphics or pavement advertisements are ideal for capturing attention, drawing in potential paying customers, and causing positive brand impact in a uniquely creative fashion. Be it a life-sized footballer advertising sportswear in-store, or monster foot prints leading the way to a children’s shoe department, this singular form of graphical marketing is a sure-fire way to make a lasting, emotive connection with customers. Be remembered, make a bold statement. The many faces of custom-printed floor graphics. Of course, marketing is just one use for floor graphics. 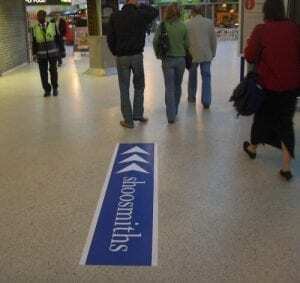 Custom-printed floor stickers may be used for promotional reasons, but they can also be used as a brilliant wayfinding solution. Graphics can be used as floor markings in public areas like bus stations, shopping centres, or sports stadiums. At exhibitions, they can help navigate clients around the exhibition hall. All the while subtly reinforcing brand messaging. Promoting events, sales promotions, floor graphics and floor ads can help appeal to potential customers, but they can also be used for parties, weddings, sports events, and more. A custom-printed dance floor? Team logos or even directing cars through a carpark, the potential uses of floor graphics is limitless. Product launches, seasonal offers, innovative interior design … your imagination and marketing prowess can run wild till their hearts desire. stickers can be moved and reused, there are no limits to how you can apply these versatile products. Our floor graphics—floor decals and floor stickers—hold up against common cleaning chemicals and are scratch and scuff resistant; robust and resilient, these effective marketing materials can withstand heavy traffic without damage. Choose 3M Scotchprint™ Floor Minders™ for conspicuous floor visuals—colourful and vibrant graphics that produce a powerful impact that really pops. Simple and fuss-free to apply, equally quick to remove, these graphics are backed by the 3M™ “Slip Resistant Warranty”. Have a space? Get it covered. For marketers wishing to make the best possible impact, take your creativity to the max with floor graphics that can be applied to any surface. Maximise both impact and budget. Marketing can be expensive, but that doesn’t mean that commanding attention need be. 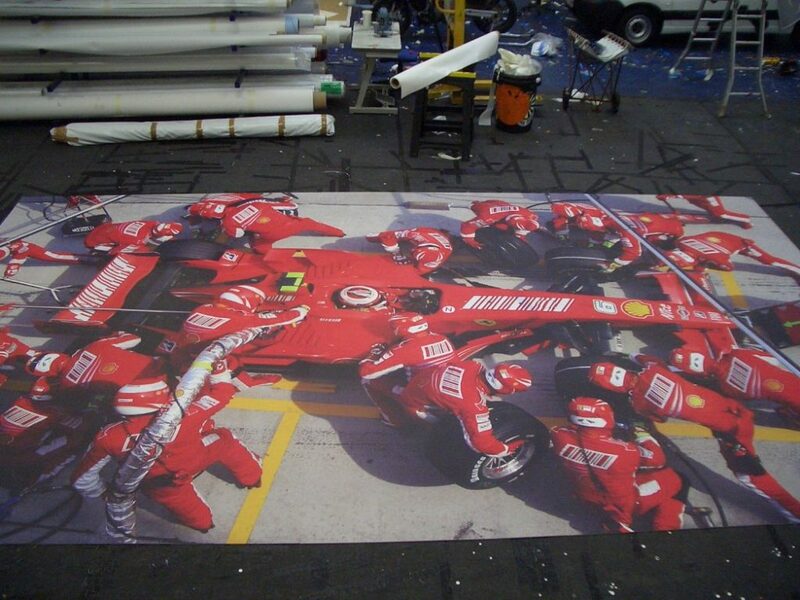 Cost-effective floor graphics will not only serve to generate brand awareness, they can generate real sales quickly. Point of sale display materials can draw attention to specific promotions or special offers. With up to 72% of all purchase decisions being taken at the retail location, advertisement signage is vital. In an age where customers waiting to be served are sucked into their smartphones, why not capitalise on a public already looking down? messaging through one-of-a-kind marketing materials like floor graphics is essential. You can massively increase sales by captivating attention, and there are few materials as visually impacting. Make the most of your marketing, wow both existing and potential customers with innovative design solutions. Forward-thinking designers will rejoice with the flexibility and freedom that can be achieved with custom floor graphics. From printed carpet to floor decals, promotional stickers to expressive wayfinding, creatives turned on by the chance to show off their talents will be drawn to the power of these innovative printed materials. Creating vivid and brilliant illustrations to beautify the interiors of a hip new café, combining marketing with the usefulness of leading customers through a complex shopping centre, or marvelling clients at a progressive beauty salon. By applying graphics to a space most think is reserved for walking, designers can disrupt and astound by turning to floor graphics. If you want more than what you’ve always got, now is the time to express your creativity, think about how floor graphics can transform spaces, bring interest and light to mundane corners, or maximise sales by talking to customers right at the moment they’re making decisions. Walls and windows are like a battleground for marketing materials fighting for space, it’s a mess of messages that can turn into loud and crackling white noise. The use of floors as a means of conveying brand messaging is surprisingly scarce, which means your marketing is battling against that of countless others. In the end, it’s only the innovators who stand out, the innovators who are remembered as long as Henry Ford. Make a change, don’t do as you’ve always done. Be different, look down to help your business go up. Memorable, flexible, capable of covering a multitude of surfaces; cost-effective and capable of maximising profits and brand awareness; a delight for creatives seeking to stand out from the crowd. Floor graphics, printed carpets, decals and promotional stickers. If you want to captivate your customers, speak to Project Print Management today. We’ve got you covered. Cost-effective floor graphics will not solely generate brand awareness, it will conjointly generate sales. Point-of-sale display material draws attention to specific promotions or special offers and with up to seventy-two percent of all purchase decisions being taken at the retail location, advertisement signage is very important. For our latest project visit our blog.